• Explain why the reports do not agree on factual information, such as numbers killed, etc. In this lesson, students study reports written through time about these two attacks, focusing on the consequences of the attacks and evidence of bias in the reports. They will analyze report sources and begin to understand the concept of bias and point of view in written historical records. When is it right to label an attack a massacre? 1. Go to the Assault on Peskeompskut (also known as the Falls Fight) scene on the 1704 website. Read about this attack and the Bloody Brook attack (discussed on the English tab). Be sure to read the Overview tab, the English tab, and the Wobanaki tab. 1. Direct students to go to the 1704 website and examine the Assault on Peskeompskut (also known as the Falls Fight) scene and read about this attack. They should then read about the Bloody Brook Massacre on the English tab. Finally, they should also read the Overview tab and the Wobanaki tab. 2. Divide students into small groups and assign half the groups to study the Bloody Brook Massacre, and the other half to study the Falls Fight. Distribute the readings listed above to the appropriate groups. 4. Distribute the appropriate Battle Summary Worksheet for each student to complete. a. Why are there discrepancies in the numbers of attackers, those who died, etc.? b. In the Bloody Brook Massacre, how are the victims viewed? c. In the Falls Fight, how are the victims viewed? d. Compare the words that describe the victims and attackers in each case. Which show more negative language? Why? 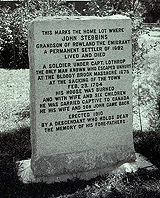 e. The attack at Bloody Brook has been known over the years as a "massacre," and the attack at the "Falls" has been known as a "fight." Which attack had more victims? Which attack resulted in more deaths? In each attack, did either victim group fight back? f. In a dictionary, look up the definitions for "fight" and "massacre." g. Should either attack be called a "massacre"? Why or why not? This lesson was adapted from one by Charlene Galenski and Kathy Klaes, teachers at Deerfield Elementary School in Deerfield, MA.